Bonus: For just a tiny bit of extra excitement, here are two from Tommy Lavergne of the parking garage going up behind Allen Center. A ruined lawn and an ugly parking garage. Not all change is good. 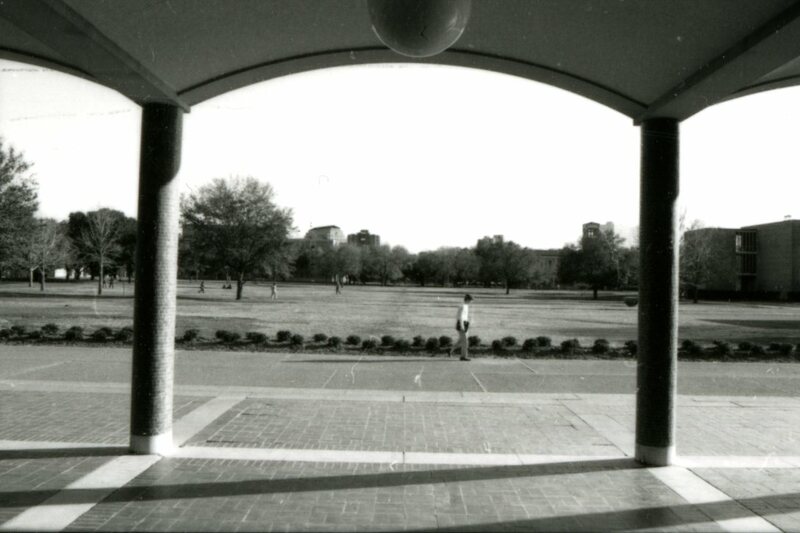 I loved that expansive lawn in front of Hamman Hall. It made the building look grand, sitting at the end of that sweep of grass. Are there any large un paved areas left on campus? That is just weird, having a building in front of Hamman Hall. The steam tunnel vent (?) (visible just to the left of the right column in the first picture) served as one of our holes in tennis ball golf. 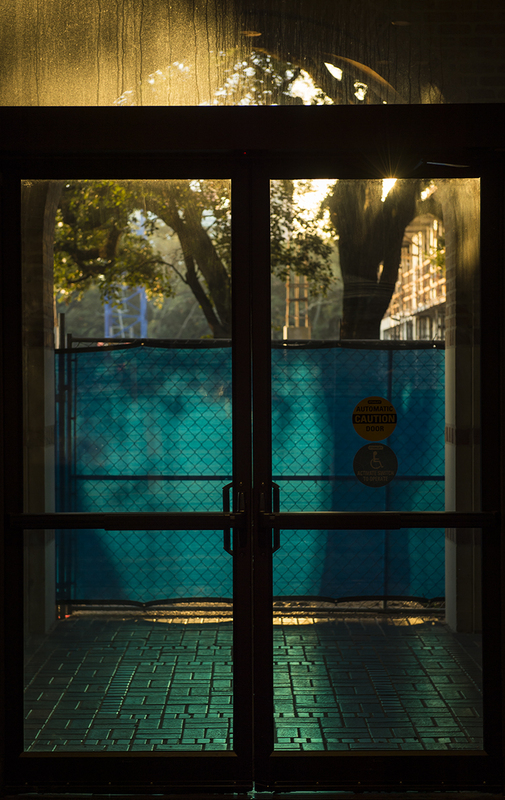 But I think that the activities that occur in Brockman and George R. Brown Halls are probably better suited to the goals of the University…plus, they make the holes more challenging. I remember flattening then Assistant Dean Gwyn Richards in a Shepherd School softball game on that lawn while chasing a fly ball. That would have been about 1983 or so. Maybe a year or two later. The filling up of that space in front of Hamman Hall was one of the most jarring things to me when I visited the campus after many years, a few years ago. It freaked me out! I’ll defend the placement of Brockman Hall. It’s an excellent design. The plan, a pair of long, slender buildings, slipping past each other, evokes the original footprint of the Physics Building (and several subsequent ones). Breaking up what is a rather large building into a pair of buildings works well in this tight site. 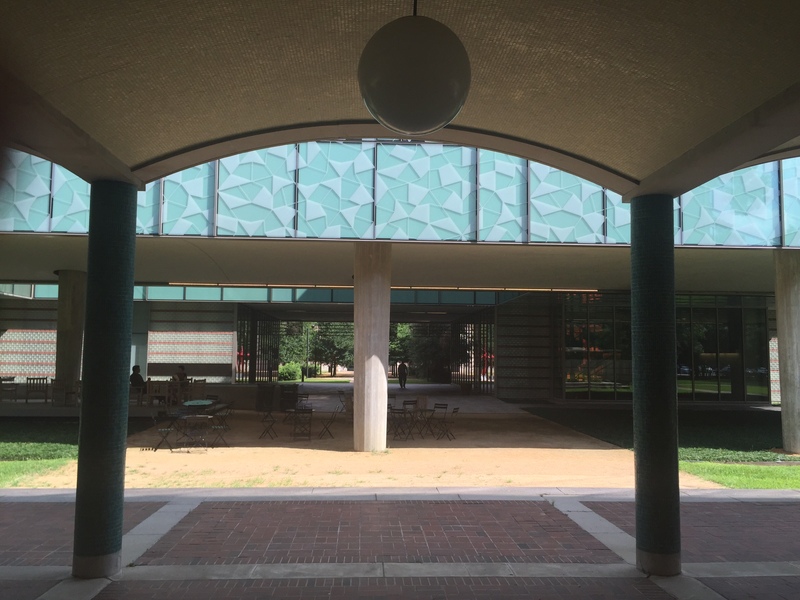 And, by elevating the wing directly in front of Hamman Hall on columns, the architects created a sheltered, open space that allows for views to and from the Hamman Hall porch, and continues the axis that connects Hamman Hall and the residential colleges beyond. The facades of Brockman are clever, inventive versions of the Rice “style,” without being banal. I consider it one of the better designs on the campus. 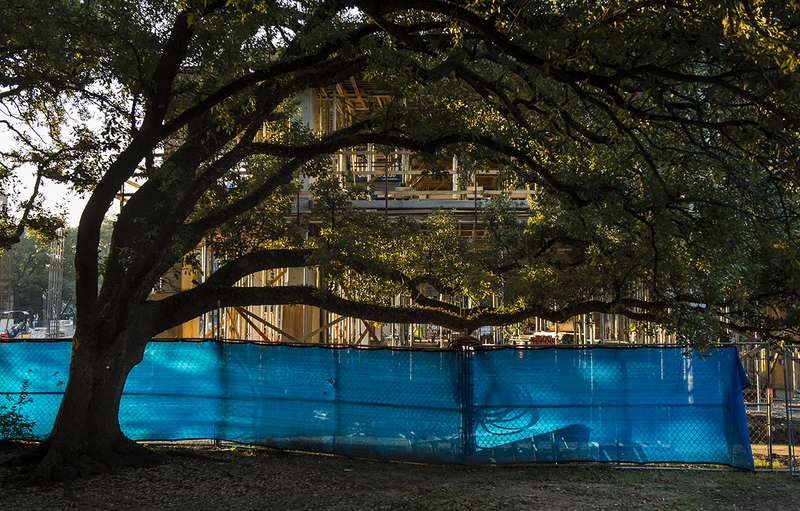 It used to be a pretty campus. Does anyone else remember the mesmerizing stillness of a foggy late night in the quadrangle? The beauty of things at the dawn and the dusk? It had to happen. But it was a beautiful, quiet, peaceful four years. Except for ‘Bum’s Rush’, of course. It’s different but it’s still pretty, especially at dawn and dusk.